Recently, WRCB News Channel 3 featured Brainerd Baptist School on David Carroll’s weekly “School Patrol” segment. The story highlights the efforts of BBS teachers have made to help 1st grade student Hayden Hudgens. Hayden is currently battling Leukemia and often has to travel to St. Judes Children’s Hospital in Memphis to receive her treatment. For the last two years, Hayden’s teachers have travelled to her home to see her, and even over 350 miles to Memphis to work with her on her school work (and have some fun as well). One of the most recent faculty additions at Brainerd Baptist School is our school nurse, Rachel Adams. This is her third year at BBS, and just about every person at BBS would echo my sentiments of, “How did we survive without her for so long?” One of the things that I appreciate about Mrs. Adams is not only her commitment to overseeing the health of our students, but also her desire to help students incorporate health into their everyday life. She is ALWAYS developing a new (and fun!) way to help our students think about their health. A few examples of some of her ideas include: the indoor walking track, the water challenge, the February fitness challenge, covering health topics (like heart health) in STEM class, and many others. Below you will read about one of our new initiatives - helping our students realize (AND REDUCE!) the amount of food we waste each day. We are blessed with an amazing cafeteria staff, who do an incredible job of making our students great meals each day. Our new focus will show our students the amount of food that they throw into the garbage can each day at lunch. Mrs. Adams gives more details below about this initiative. This challenge comes on the heels of BBS once again winning first place in WRCBTV’s Share Your Christmas food drive for most amount of food collected in the small school division. This was not planned, but could not have been better timed. Last week during chapel, our students learned that 1 lb. of wasted food is equivalent to approximately 1 meal. Each day we throw away a lot of food, but our staff was curious to see just how much. This curiosity and the desire, to be better stewards of what we have, led us to take action. Wingfield Scale Company has graciously loaned us a commercial scale to make data collection possible. We are so thankful for their partnership with us. 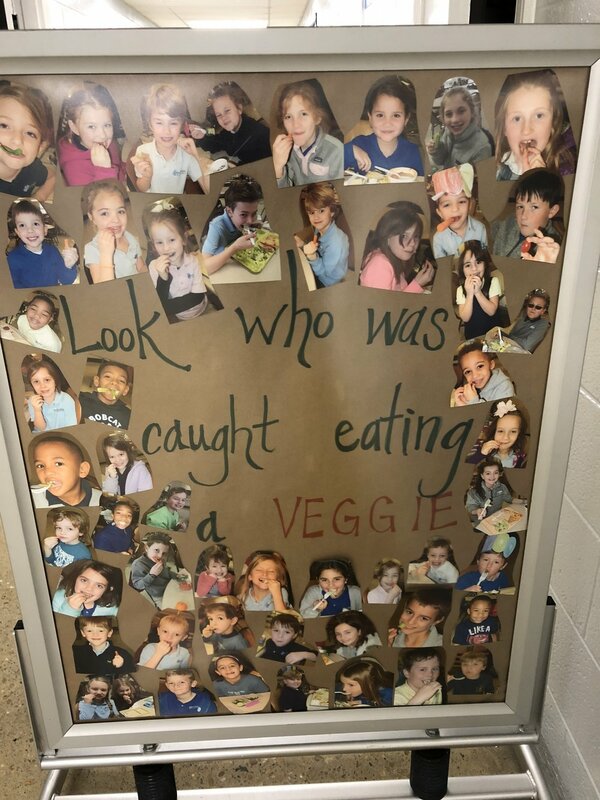 Rachel Adams, our school nurse, has done a phenomenal job of developing fun and creative ways to help our students focus on improving their health and their choices that they can make to help them have a healthy lifestyle. Last year, Mrs. Adams partnered with our PE program to develop a monthly fitness challenge in the month of February. This year, Mrs. Adams and Mr. Owens have developed another fun and challenging month to help our students focus on their health. Mr. Owens has written the following blog post to help our parents see all the fun ways they can be involved with this special challenge as well as a special calendar showing the days/events. We hope that you will join in on this year’s fun by participating in the BBS February Fitness Challenge! Follow our February Fitness calendar of exercises on the back of the page to complete this challenge. Each week that you complete all of the daily exercises, cut out the raffle ticket on the bottom of the page, fill out your name and teacher, and have it signed by your parents. Then, turn the ticket in to your homeroom teacher on the following Monday to be entered into the raffle drawing (to lead PE for one day). There will be 1 raffle winner per grade level that week, and the winner will be announced on the Tuesday morning announcements. If you complete the entire February Fitness Challenge, simply bring in the final “February Fitness Champion” raffle ticket to receive a special certificate. Good Luck as you become BOBCAT STRONG! Last year, I asked 4th grade teacher Vikki Cole to write a blog post about her “Shakespeare on the Playground” creation. Over the last two years, she has done an after school club for interested 4th and 5th grade students focusing on the famous works of Shakespeare. She guides them through a specific literary work, and then the students act out this work in a mini play. The plays are rehearsed to be performed in the open air on our playground (our own version of the Globe Theater! ), but the weather does not always cooperate. In the post below, Mrs. Cole talks about the fall production that was performed this week. I so appreciate that our faculty is dedicated teachers like Mrs. Cole, who strive to provide new experiences for our students. “What if I mess up?” a student wailed. It was two minutes until show time, and I was talking nine, nervous 9 and 10-year-old “players” off the proverbial edge of panic. Huddled just offstage, they were a mishmash of wings, fake mustaches, velvet flat caps, and ivy crowns - the absolute best the church’s wardrobe closet offered for their diminutive sizes. “Someone will mess up,” I stated calmly. “We’ve even practiced that. We’ve got this!” I assured my tiny troupe. Alas, the fall 2018 BBS production of A Midsummer Night’s Dream did NOT go off without a hitch, just as predicted. Oberon and Puck had a conversation in Act Two, which wasn’t supposed to occur until Act Four. There were a few mispronounced words. A two-ton truck metaphorically ran over a couple of Shakespeare’s original lines. And one player ran on stage at the wrong time, paused, and loudly declared, “I’m not supposed to be here right now!” before dashing away. However, the performance was a hit in its own topsy-turvy, uniquely creative way. These young actors showed up despite their fears. They delivered their lines and “caught” each other when necessary. They laughed with the audience, and one another. They kept going when something went wrong. Actually, there was little chance of this elementary performance becoming a complete fail. After all, the audience was primarily composed of parents and grandparents, shoe-ins for standing ovations and catcalls of praise. Yet, even without such a generous audience, the show would have still been a success. These children acted their hearts out. They gave it their all and left it on the stage for our utter enjoyment. They showed courage, perseverance, dedication, and humor. I have never been prouder of a group of people. As I have written previously, I am convinced that one of the most important aspects of my job is hiring the right teachers to join the faculty of our school. I echo this theme each year when I write this blog post, but it really is true. Identifying the teachers that align with our culture and mission is critical to the sustained success we have enjoyed at Brainerd Baptist School. I have often joked that "retirement and babies" are most often the culprits for change in our faculty, and this has once again proven to be the case this spring. While we had more openings this year than I can ever remember having at one time, we were blown away with some amazing applicants for our open positions. What was particularly encouraging for us was the number of alumni and former faculty who applied. With so many great applicants, just selecting the candidates to interview was a challenge. However, our faculty teams did an amazing job interviewing many candidates for our positions. Please join me in welcoming the following new teachers to Brainerd Baptist School for the fall of 2018. 1st Grade - Ms. Natalie Daniel - Natalie is a graduate of Brainerd Baptist School and was involved in our STUCO organization before attending Baylor School. She is a recent graduate of Birmingham Southern College where she was involved in activities like lacrosse, Honor Council, student government, and many more. 2nd Grade - Mrs. Christy Martin - Christy is a former first grade teacher at Brainerd Baptist School. She trained under Mrs. Deb Stromberg, and her first students are now seniors in high school! She also graduated from Baylor School before attending the University of Tennessee, Chattanooga to earn her degree in elementary education. After taking time to have children and assist her husband in their family business, Christy is excited to return to the classroom. Bible/Chaplain - Mr. Preston Kane - Preston is also a graduate of BBS. He then graduated from David Brainerd Christian School and attended the University of Tennessee, Chattanooga. He has spent a year in Mongolia on mission work during college, and has recently returned to Chattanooga after living in Louisville, KY, where he attended the Southern Baptist Theological Seminary. Preston and his wife, Alex, are the proud parents of a beautiful baby girl, Elowen. K4 - Mrs. Karica Harner will be moving from a teacher assistant position into a teaching position. Karica is finishing up her master's degree in education from Liberty University and has been waiting for the right opportunity to move into a teaching position. K5 - Mrs. Rebecca Stubblefield will be moving from K4 to K5. Rebecca also recently completed her master's degree in education from Carson Newman University and has been patiently awaiting a full-time position. PE/AD - Dr. Chad Owens will be moving from the Bible/Chaplain position to serve as our PE teacher/AD. Over the last few years, Dr. Owens has helped coach both volleyball and basketball. He is an exercise, nutrition, and wellness enthusiast and is looking forward to building upon the foundation that Coach Ledbetter has put in place. K4 - Mrs. Chelsey King will be moving from K5 to a K4 position. Mrs. King has taught K5 the last two years. Mrs. King recently had her third child and is moving into a part-time teaching position to accommodate her new schedule. 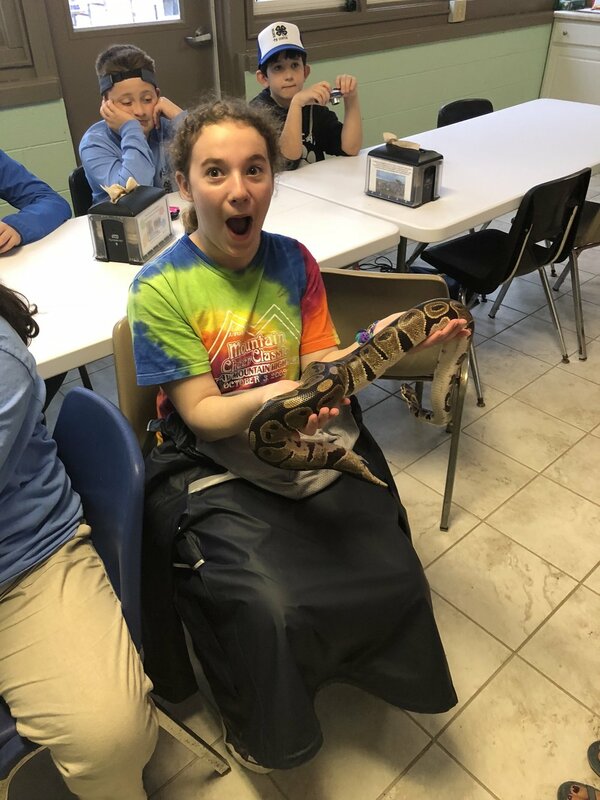 Emma is pretty excited to be holding a snake! Shark Dissection - although self explanatory, this was a neat experience for most of our students. We did have a few that gave it a valiant effort, but in the end chose to step out. If you do not see a picture of your child in the dissection, that means that did not want to participate. Beach Ecology - we loaded up on buses for the short drive to North Tybee. Our students learned about sand dunes and sea turtles. The students were divided into pairs and had to create their own ocean habitat. While we were doing this, several dolphins decided to grace us with their presence. They swam back and forth practically right in front of us for several minutes. Reptiles - the groups got to go through several classes learning about various types of reptiles. The were able to hold an alligator, several types of snakes, crabs, and turtles. Night Walk - we loaded back up for a quick trip to the beach. Students learned about various topics like bioluminescence, echolocation, radar, pirates and night site, and other topics. We have some really cool things planned for tomorrow including marsh ecology and surf sleuth. We will continue to post pictures to our social media pages. I am well aware that we live in a region of the country that is dominated by football. I would even say that it is not just any football, but rather the king of football - SEC football. We all take pride in the fact that our brand of football is far superior to the football played in other parts of the country. The championships are certainly there to back up that claim. Since the inception of the BCS, no conference comes close to the championships claimed by the SEC. In fact, we (collectively speaking) brag about it so often, and with such fervor, that we usually end up offending people who have allegiances to other schools not located in the friendly confines of the Southeastern Conference. Those of you who know me well, know that I have a strong allegiance to my beloved Volunteers of the University of Tennessee. I frequently travel to watch them play and have had my heart broken by them many, many times. While I wholeheartedly believe that the brand of SEC football is, from top to bottom, the undisputed champ of all the conferences, I would like to serve up a different type of question for you to consider. What is your bucket list of sporting events? I wrote a similar post to this almost ten years ago. For me personally, this week is the best in all of sports (even better than SEC football!). You have the conclusion of my absolute favorite sporting event that really does drive us all mad - March Madness (how's your bracket look!?) combined with the beauty and pageantry that is The Masters, combined with opening day of Major League Baseball....and just for fun, both the NBA and NHL are in the final weeks of their regular seasons making both of them somewhat interesting. I would like to list my personal "bucket list" of 10 items that I would like to experience in my lifetime. I am happy to report that I have indeed crossed an item or two off of this list, but there is much work left to do. I would also love to hear about your items. I will most certainly see something that someone else listed and think "oh yeah, I want to do that too!". The great thing about post like this is that they are highly debatable. So without delay, here goes my list. Although not necessarily in order, I am weighing the bigger items near the top. Augusta National - I have had the joy of walking the hallowed grounds of this amazing place a couple of different times. I've been to both the actual tournament as well as a practice round. Although I'm not necessarily a huge fan of the PGA. I typically will watch all of the majors, and not much of any other tournament, unless my personal favorite, Phil Mickelson, happens to be leading on Sunday, which doesn't happen that often any more. That said, I find myself glued to coverage of the Masters. I can't explain it. I really think it is a combination of things from the incredible beauty of the course, the history of the tournament, the intense competition for the green jacket, and the painstaking attention to detail that is exhibited by the folks that put on the tournament each year. I remember being surprised by just how hilly (is that a word?) the course was. You do not realize it until you walk the course as TV just doesn't do it justice. I love everything about it. If you have never been, it should be high on your list. Watching a Red Sox/Yankees game in Fenway - I have a tendency to cheer for the underdog. I have been known to give people a hard time who seem to pick and pull their favorite teams from all over the country with seemingly no allegiance to anything. The worst fan for me is the fan that is considered the "bandwagon" fan and just happens to cheer for teams from all over the world that also happen to be really good! If my state has a team (sans Memphis, because no one in middle or eastern TN really even thinks about Memphis as a part of the state since it is six hours away!) I cheer for them. NFL - yep, I'm a Titans fan. NHL - you got it - LOVE the Preds (excited to be going to a play-off game soon! ), I've already mentioned my love for all things University of Tennessee, but we do not have a MLB or NBA franchises in our state, so one must go elsewhere for a favorite team in those sports. As a child, almost EVERYONE I know pulled for the Braves. There proximity makes it easy and I flirted with them too. My parents took me to a couple of games in Atlanta and my favorite player was Dale Murphy (I just dated myself!). But the Braves were never any good during my childhood, and in fact, they were awful! I guess you could say their perennial losing never caused me to fall in love with them. When I was younger, and to a certain extent, still now, the New York Yankees were king of the world. They had fans everywhere, and were often just better than everyone else. The poor Red Sox just couldn't compete. I began pulling for the Red Sox largely just because it seemed like the rest of the world pulled for the Yanks. My years of cheering them for them during the lean years has been rewarded since 2004 with 3 world series rings in the last 15 years. I would LOVE to see them play the Yankees in Fenway. The intense hatred between the fans of these two teams will always have this high on my list. Duke - North Carolina game - Much like #2 on my list, the pure mutual hatred of these two rivals makes this a match up that I find compelling. I'm not necessarily a fan of either team, although I have a lot of respect for both programs. I think I would just like to witness firsthand the craziness of Cameron Indoor Stadium. I was able to watch the Vols play North Carolina this past season in Knoxville. I always appreciate a knowledgeable fan base and I certainly found that to be the case of the Tar Heel fans, and I would expect the same with Duke. 4. The Vols in the SEC Championship or College Football Playoff - For most of my life, this wasn't necessarily a "bucket item". I went to my first Tennessee Vols football game when I was 9 years old. I have been back countless times since then. I actually was at a SEC Championship game that the Vols played in early in the 2000's. I have seen some amazing games in my Vol fandom traveling to College Station, Nashville, Gainesville, Athens, and Atlanta to watch them play. My favorite memory (to date!) was the famous play I refer to as the "Dobb Nail Boot" in which Josh Dobbs completed a Hail Marry to beat UGA as time expired in 2016. I shared this miraculous comeback with my son and some friends, and we both still like to laugh about that night in Athens. Of course, he and I were on the receiving end of that type of loss this past season when we traveled to Gainesville and watched Florida complete a very similar pass to beat us. The Vols have suffered through their worse decade of football in their 120+ history. Having them being relevant again would be awesome. I would love to see them competing for championships again regularly like they did for so long when I was younger. I have often said that my boys have never seen Tennessee as a good program like they were pretty much the first 30 years of my life! I admit, this is a real fandom heart pick item. 5. Boston Celtics / LA Lakers Game - As I explained above, Tennessee doesn't have a NBA franchise (at least they didn't when I was growing up). As a child, I LOVED Larry Bird. I remember having his Converse shoes when I played on my elementary basketball team (we were pretty good I might add as we won the city championship!) I am fairly confident that it was Bird's shoes that propelled us to victory. Jordan mania was huge later in my childhood and into my teenage years and I certainly liked Michael Jordan, but for me personally, Larry Bird was the man! I loved the way the ugly, white dude from Frenchlick, Indiana just outworked everyone. I spent many a evening shooting basketball in my back yard trying to emulate #33. The Lakers/Celtics rivalry was pretty special back in the 1980s too. ESPN did a 30 for 30 on it and it was compelling. I HATED Magic Johnson and the Lakers. Although this rivalry isn't as strong as it was back in the day, I would still enjoy taking in a game between the two winningest franchises in NBA history. 6. Watching Team USA in a World Cup Game - Two thoughts - first, I realize that many of you are scratching your head on this selection. Why would a man from the south, have a soccer game on his bucket list? If you're thinking that, just admit that you don't get it and keep reading! Second, yes, I understand that just qualifying for the Cup seems to be an issue for the red, white and blue! That said, assuming we do actually make into the World Cup again, I think it would be a really, really cool experience to cheer on our boys. The sheer excitement of this type of game would be incredible. And since it is my bucket list, I would prefer to watch this game somewhere in Europe, where the soccer atmosphere rivals (or dare I say beats) SEC football. 7. Playing a Round at Pebble Beach - I will readily admit that I am not much of a golfer. In fact, I do not even remember the last time I played. It has been a minute or two! That said, I do enjoy golf, and hope to someday play a little more. When I do, high on my list is visiting this course. I have watched various tournaments on TV that have been held there for years and think the beauty is amazing. Those amazing ocean views and holes would have to be better in person! Who is ready to hit the links? 8. Attending Wimbledon - I have long been a fan of tennis. It is really the only sport that I've ever truly had a little success in. I did fairly well in high school with tennis and I enjoy playing, although like golf, I don't play as often as I should. Much like the Masters, I am enthralled by Wimbledon for several reasons. I love the history and beauty of the sport. The playing surface is pretty cool too. This bucket list would also require traveling to another country, which is always fun too! 9. Hiking a REALLY Big Mountain - I am smart enough to realize that I want to part in trying to summit Everest! That would be a death wish! About ten years ago, Katrina and I hiked a volcano (Cotapoxi) in Ecuador. Here's the thing though, we drove up to about 12,000 feet, and then walked to a camp that was at 15,000 feet. This wasn't even the summit, but it was AMAZING. I think it would be really cool to maybe hike Mt. Fuji, McKinley, Kilamanjaro, or some other really cool mountain that wouldn't necessarily kill me. 10. Running with Bulls - I realize some of you may be scratching your head on this one. I understand that this is not a traditional sporting event as well. That said, I think this would be really fun. It has several things that attract me to it. First, there is an element of danger to it. That always makes things a little more interesting. There is also the travel factor. Who doesn't want to travel to Spain!!! There you have it. My personal 10 items that make up my "Bucket List" I am hoping to check these things off before my time on earth is done! What are yours. Nurse Adams recently approached me about an idea to incorporate to have a week of school in which we specifically focus on living healthier lifestyles. I thought it was a great idea and asked her to further develop this. I am excited to share with you her thoughts and ideas for our students. The week of May 7-11 will be a time when we focus specifically on various health initiatives for our students. Our week will conclude with Field Day, which has long been a day of exercise and fun for our school community. A parent seminar will be offered by life coach Michele Reneau of Weekly Fig on how to get your kids to eat vegetables. Mark your calendars for May 10th @ 8:30 a.m. The week will end with field day. We appreciate these local companies partnering with us to impact our students health in a positive way. I hope you will take the time to learn more about them. If you have questions, please feel free to contact me at radams@brainerdbaptist.org. If you, like me, are going nuts over the thought of another snow day, you may enjoy reading anything to take your mind off the fact that we are missing another day of class! I like to share things in this space that are of interest to parents. I happen to have 3 "iGeneration" kids living in my house, and usually have a few others here visiting on most days! I am now also in the place where the oldest of this generation are applying for jobs now. I found this piece very interesting and helpful to understand the thought processes behind why our kids act the way they do sometimes! The piece below is written by Eric Geiger, a popular author who works for Lifeway and has a popular blog. Do you agree with Geiger's descriptions? I would love to hear your thoughts. Boomers. Generation X. Millenials. You have likely read research and descriptions on each generation. While generational generalities cannot adequately or specifically describe individuals, generational names and descriptions endure because they are helpful in understanding the influences and the commonalities in a generation of people. Thus parents, ministry leaders, and educators are wise to pay attention to research and trends describing each generation. While there is not yet an agreed upon official name for the generation after the millenials, and dates vary a bit among researchers, iGeneration is the name Jean Twenge assigns to those born in 1995 through 14-17 years post-1995 (the year the Internet was born to the world). So in 2018, those in iGeneration are 6 to 23 years old. Maybe you have already heard them referred to as Generation Z, but iGeneration may be a better name because they are the first generation to be born into our constantly connected world where social media and screens are the norm. They are digital natives; meaning digital communication is not something they have had to learn. It has always surrounded them. I parent two daughters in iGeneration. They fill our elementary, middle school, and high school classrooms and are currently in our kids and student ministries in our churches. High school seniors in 2015 spent twice as much time online as high school seniors in 2006. High school seniors spent an average of six hours a day texting, gaming, or on the Internet. With all that time on a screen, iGeneration doesn’t read as much as other generations. In the late 1970s, the majority of teenagers read a book or magazine nearly everyday. In 2015, only 16% did. Sadly, technology has not supplemented reading; it has supplanted it. Instant communication and constant connectedness is making iGeneration impatient and bored with long and deep reading sessions, which cannot be good because of the deep learning and growth that reading produces. Here is one snippet of research: 8th graders who spent ten or more hours a week on social media are 56% more likely to be unhappy than those who don’t. Why does more time on social media produce less happiness? Maybe, like me, you remember “yearbook day” growing up—the day you would get your yearbook, discover the group photos throughout, and pass around your yearbook for friends to sign. It was filled with highs and lows. A girl you liked could sign her name with a heart and a sweet message! Or she could half-heartedly only sign her name. You may find a group photo you loved or discover one with many of your friends without you, which reminded you of moments of feeling left out. Imagine every single day being yearbook day, the constant ups and downs of having photos liked or ignored, the anxiety of seeing photos where you were left out. Heavy social media use is driving significant unhappiness during the critical time of adolescent development. Not surprising, but those who stare at their phones all day during their formative years will struggle to interact relationally with others. As a whole iGeneration is not learning to look people in the eyes, read non-verbal communication, and converse over a meal. Ironically, growing up constantly connected has harmed iGeneration’s ability to connect. Every skill takes practice and the skill of socially connecting to others is being practiced less and less. In the midst of the constant connectivity, iGeneration is lonelier than previous generations. On average, loneliness increases as social media use increases. Watching the lives of others unfold online has created an iGen specific term—FOMO (Fear of Missing Out). In previous generations, if you missed an invite to a party, you may have heard whispers about the party a few days later but life seemed to quickly move on. When an iGen’er misses out, their missing out is chronicled and archived in the public space for everyone to see. There is no way that does not create feelings of loneliness among people who really do want and need relationships (we all do). It is almost the time of the year where we send out re-enrollment packets and once again ask our parents to sign their child back up for another school year at BBS. Over the years, I have had many conversations with parents about how the entire "re-enrollment process" is just cumbersome. Why do we ask families to fill out forms each year and make them mentally decide to come back? Most of the time the information that is asked hasn't changed from the previous year, and our retention rate averages about 96% each year, which shows that the majority of our families intend on having their child graduate from Brainerd Baptist School. Back in November, I began to explore the possibility of changing the way we do re-enrollment. I was driven by the thought of how can we make this process easier (and better) for our parents. What if we formally instituted a policy that followed our mindset, which is, "we are committed to educating your child and will reserve a space for them until they graduate"? Basically, like when a student enrolls in college, your contract will serve as the binding agreement for your child's remaining years at Brainerd Baptist School. This process that many schools across the country are adopting is called "perpetual or continuous" enrollment. In a couple of weeks you will receive your last annual contract from Brainerd Baptist School. In a few weeks, our parents will complete the re-enrollment process for the final time! We will no longer require you to jump through many hoops. Any parent that does not intend for their child to return will simply notify the school (in writing) during the opt-out window each spring. We are excited about this change, and really believe our parents are going to love not having to worry about this process anymore. For those of you who are interested in reading more about this concept, here are some links to some articles that talk about it more in-depth. Three Reason Why Continuous Enrollment Makes Sense. Automatic Re-enrollment: Could this work at your school? I love the fact that our school community is often willing to take a critical look at ourselves in the mirror and look for opportunities to improve. I really do believe that our parents are going to love this change. We will soon be communicating more specific information about this change. If you have any questions before then, please feel free to reach out to me. Earlier this week I emailed all of our families about our upcoming Parent Seminar series. I shared the line-up of topics and speakers and encouraged our parents to sign up (so we can plan appropriately) and many of those forms have started coming back in. Today I want to take some time to explain the logic behind why we offer this special night, and why we are strongly encouraging you to take advantage of this parent resource. I readily admit that there are often times that when I arrive home, the last thing in the world that I want to do is get back out to attend an event. We all work hard and life moves quickly. Sometimes I just want to fall into my favorite chair and relax after a long day. I know this is a common battle that we face when scheduling something like Parent Seminars. The reason we do this is because we want to be a valuable resource to our families. You invest a lot of time and money in your child's education - obviously, it is important to you. It is also important for us to be a resource that helps parents as they navigate walking with their child through elementary school. There are things that we do that I like to call "value-added" pieces of being a part of the Brainerd Baptist School community, and this is certainly one of those. I think we can all admit that the expectations of students have changed in the last twenty years. Our students are challenged to manage their school work, which looks different, as well as an ever increasing demand of extra curricular activities. It seems as though (and research would support) that we have accelerated so many experiences in life that our students face things quicker than they did years ago. I know it is not easy to necessarily come back out to such an event, but I hope you will take advantage of this time. We have provided childcare for school aged children and are also offering volunteer hours for parents who attend. Each year there are parents who say, "We are so glad we came. We learned so much!" If you have never attended before, will you make plans now to join us? For those who have been around Brainerd Baptist School any length of time, you know that we are really big on offering many different ways for our students to learn. Gardening, STEM, Coding, Cooking and many other classes we offer proves this point. We know that children can learn in many different ways, and we beleive that there is often a high value to offering multiple ways for students to learn. Recently, Rachel Adams, our school nurse, decided to offer a different way of learning to our students. Below she talks about a unique opportunity students were given to show their knowledge on a recent topic covered in our STEM class. I recently spent time with each grade talking about the importance of handwashing. We did a STEM activity in which I used a black light and glo-germ to simulate the amount of germs on their hands. To help us better understand the importance of handwashing, we encouraged the students to make a video with some targeted information that was geared to helping us remember some important guidelines when we wash our hands. The competition has come to an end and I am so proud of each student that participated. We had a total of 9 videos submitted from students ranging from 1st to 5th grades. We also had one submission from our faculty and staff. Over the next few weeks we will watch the other videos in chapel. The CDC states, "regular handwashing, particularly before and after certain activities, is on the best ways to remove germs, avoid getting sick, and prevent the spread of germs to others. It's quick, it's simple, and it can keep us all from getting sick. handwashing is a win for everyone, except the germs." Even knowing this, we often neglect to wash our hands. My hope is that this competition, combined with our STEM lab handwashing experiment, will remind all of us of the importantance of washing our hands to stay healthy. The video below was selected as the winning video. It was created by three 5th grade students - Creed Warren, Sam Wiggins, and Graham Stubblefield. Our hope is that it both reminds and encourages you to WASH YOUR HANDS! Our Parent Support Organization came up with a fun, innovative way to help raise funds for our 2017-2018 school year. The Spartan Warrior Race (our Fall Fundraiser) was exciting for our students and proved to be a very successful event for our school. Because of the additional money raised, thanks to our supportive families, we are going to be able to purchase some additional items for our school. At our Open House, Director of Development, Ellen Baggenstoss, explained the significance of our three different fundraisers (Fall Fundraiser, the Annual Fund, and our Auction) and the purpose they serve for our school.They all have a very specific focus, with the end goal always being to provide programming, brick and mortar projects, or capital improvements that directly benefit our students. Originally, we were hoping to raise enough money to make some program enhancements to our STEM lab by adding a few 3D printers. We didn't really know what to expect as far as how much money the fundraiser would raise. Because of this, we were being very conservative in what we were telling our students. I didn't want to put myself in a position where we promised our students something amazing to later have to come back and say, "Sorry kids, we didn't raise enough money to do those cool things I promised you." I am very happy to report to you that we FAR exceeded our original goal! We are in the process of ordering the printers for the STEM lab and can't wait to see all the outstanding things our students will be able to create. When we embarked upon our playground renovation a couple of years ago, we spent considerable time and resources saving three large trees on the playground. There are 2 large pines in the K3/K4 area, and a large oak tree on the other end of our playground in between the athletic field and the swings. In addition to their natural beauty, these trees provide a significant amount of shade. The landscape architect told us that there was a 50% chance the trees may not survive because of the amount of dirt we had to move around the base of the trees. Over the last two years, the oak tree has shown signs that it was not doing well. On two different occasions we had a tree company come out and work on it in an attempt to save it. Sadly, this summer, the tree began to look like it was almost completely dead. This created a safety issue for us. The last thing we would ever want is for a child to be injured by a falling branch. Over fall break we had a company come in and take the tree down. This means that side of the playground no longer has shade! This is where the Spartan Warrior comes in! Because our families so eagerly supported this event, we are now going to purchase a shade structure (like in the picture), as well as a large picnic table! Students and teachers will have a place to rest when things get too hot. The bench that is now in this area will be moved near the tree that STUCO purchased in honor of Todd Wood. This is possible because of YOU! Thank you so much for supporting our school and students. They will benefit from your generosity.